Our original heavy-duty vinyl canopy. 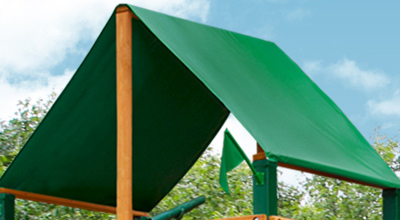 Vinyl canopies offer protection from the sun and provide shade and cooler temperatures! 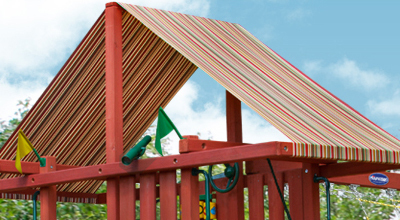 All cedar wood roofs, made of the same high quality lumber as the swing set. Many include dormers and a chimney. 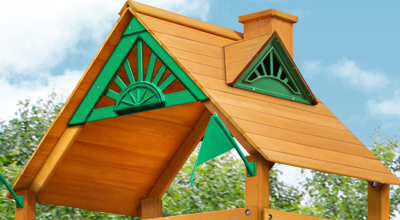 We also have two add-ons you can add to your set, either a Treehouse Add-On or the Treehouse with Fort Add-On. A twist on our all cedar wood roofs. 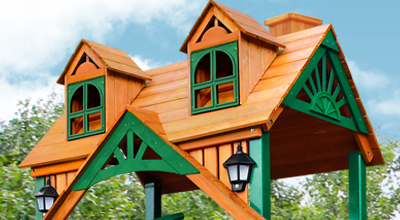 Made of the same high quality lumber as the swing set, these roofs include decorative sunbursts, dormers with decorative windows and chimneys. These roofs also come with two solar wall lights!